Eclectic, creative, pure fun: the art of Peter Beerits at Nervous Nellie’s | Oh, the Places We See . . . 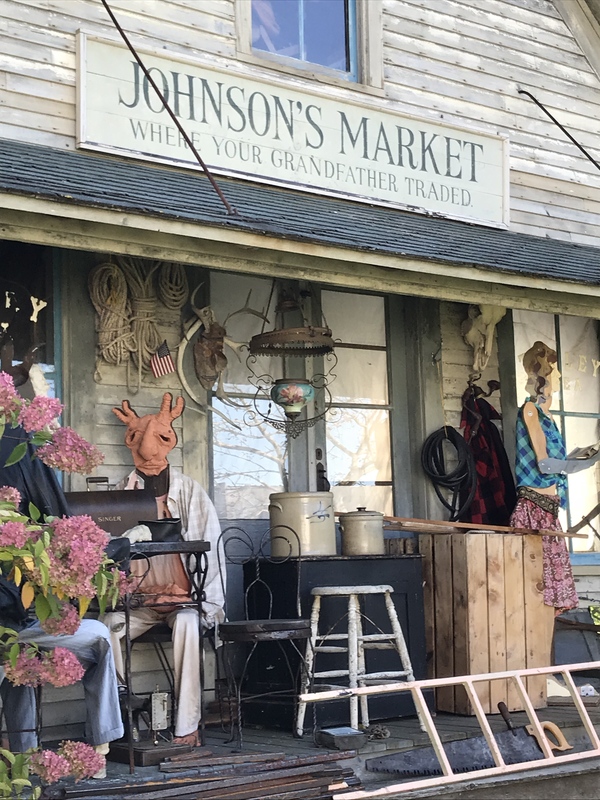 If you’ve seen Nervous Nellie’s Jams and Jellies at tourist destinations and grocery stores all over Maine, you may have thought you’d seen it all. And in some ways, you have. Those made-in-small-batches jams cooked in a steam-jacketed kettle using wild Main blueberries stand on their own for quality and taste. As do their other products — red raspberry jam, blue razz conserve, Sunshine Road marmalade. They offer products you don’t even expect: Joan’s Scones, Maine Wildflower Honey, and Maine Maple Candy. The list goes on. But “way off” may have another meaning. Nervous Nellie’s has what you might never expect to see but what would make you come back in a heartbeat. 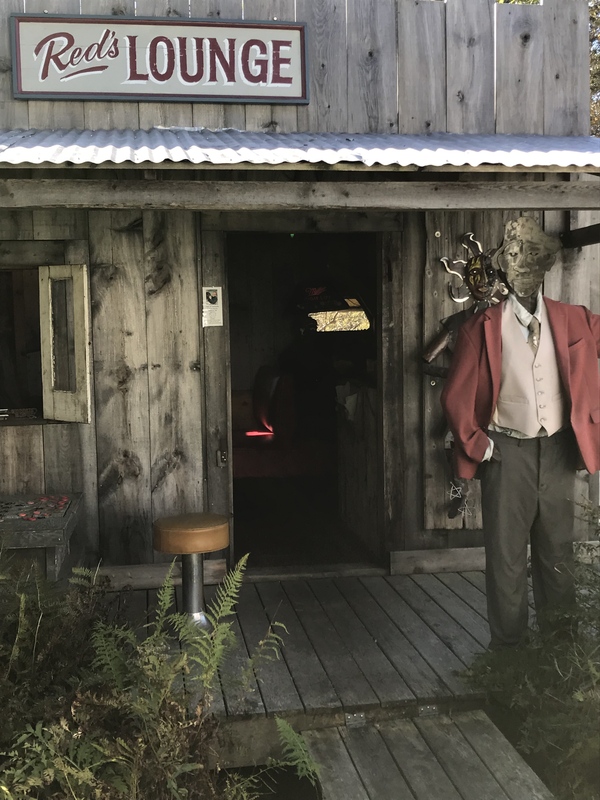 Greeting you at the edge of the parking lot is the find of Deer Isle: crazy, fascinating sculpture of Peter Beerits, who is also the co-owner of Nervous Nellie’s with his wife Anne. Greeting you at Nervous Nellie’s and guarding bits and pieces of future art for Peter Beerits is this Mainer made of found objects. You see, Beerits takes parts, lots of parts (like what most people would toss into the trash or recycle bin) and then fashions them into people, dogs, desks, chairs, you name it. Enjoying the porch are Peter Beerits’ lady and dog. As if that weren’t enough, he strategically places his found-object folks into Nellieville, the little town that keeps on growing. 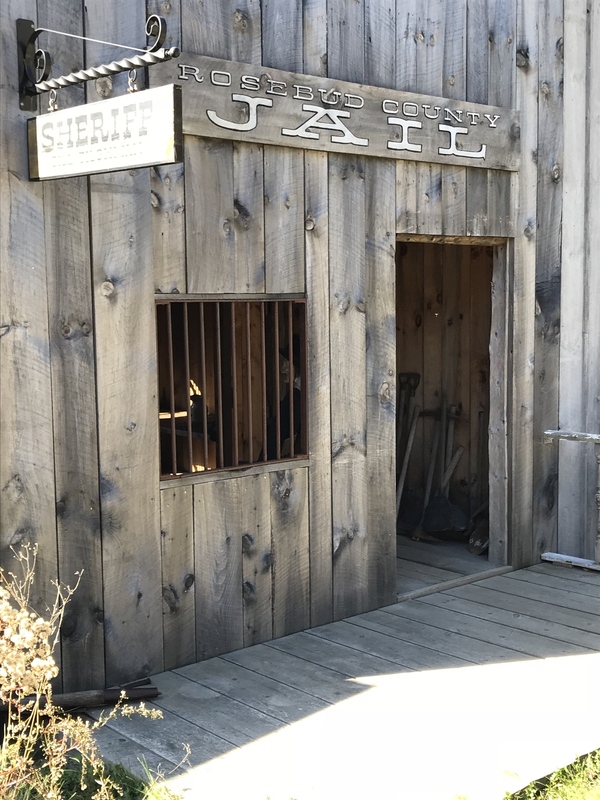 Right now, Nellieville is home to a blacksmith shop, bank, school, and garage filled with musicians. But Beerits admits there’s more — a wizard’s tower perhaps? Opera house? More-or-less bimonthly tours of Nellieville? No tellin’. But if a town’s known by its residents, check out the folks of Nellieville. Beware of dragons at Nervous Nellie’s. A pondering piano man seems a bit pouty. Let the good times roll at Red’s Lounge. 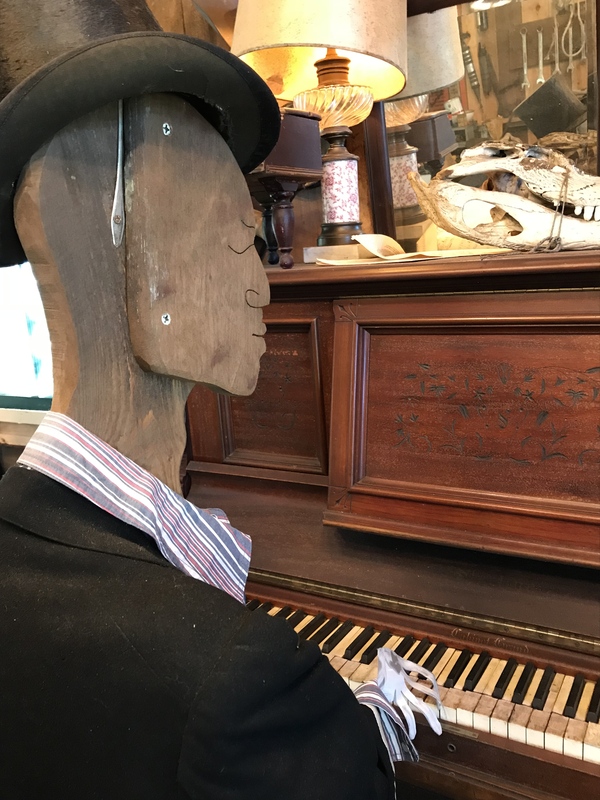 So, if you’re visiting Maine, be sure to stop by Nervous Nellie’s Jams and Jellies — not just for fine homemade local-sourced jellies and jams but also for art. Not your type? Just move on! Or, if you like, park yourself on the porch and talk to the residents who rarely talk back. Besides, you just might learn a thing or two. Teacher? Student? Who’s learning what? So, ship home a case of Red Raspberry Jam and tour the sculpture of Peter Beerits at the same time? Nervous Nellie’s on Sunshine Road in Deer Isle, Maine. But don’t bring old rusted-out tools to donate. Beerits has aplenty. For more on places we loved in Maine, head to August Down East for our pictures and posts. 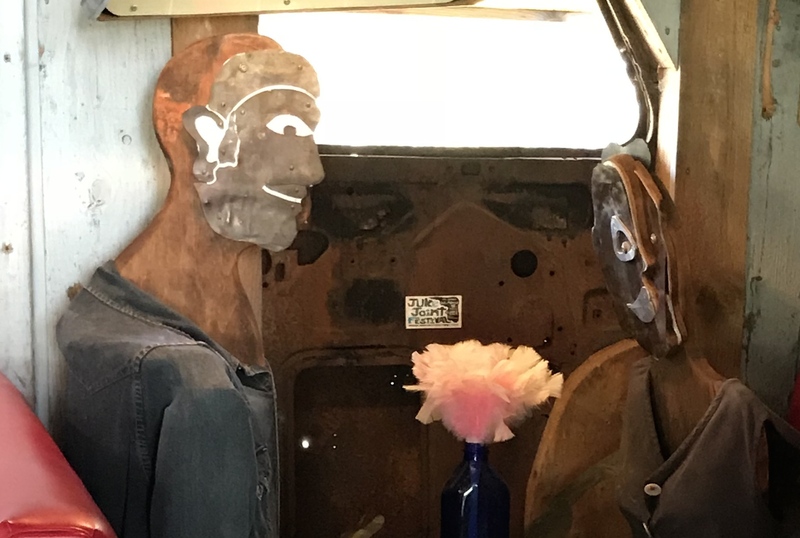 This entry was posted in Autumn Down East, Maine, Travel and tagged art, Deer Isle, found objects, Maine, Nervous Nellie's, Peter Beerits, sculpture. Bookmark the permalink. Thanks so much for taking a look at Nervous Nellie’s. We bought a case (oh my, a case!) of that blueberry jam, and, even after giving away jar after jar at Christmas, we still have a shelf dedicated to the product in our pantry! Not complaining, though. Blueberry jam is great on English muffins! Oh, my gosh. Can you rush down to Tennessee and serve that to me! Wow! I’m totally fascinated. Creativity knows no limits! Thank you and greetings. Thanks for taking a look. Don’t you just love it when someone takes next-to-nothing and makes something of it?! We had fun going to each of the buildings in Nellieville — and being surprised at each turn. 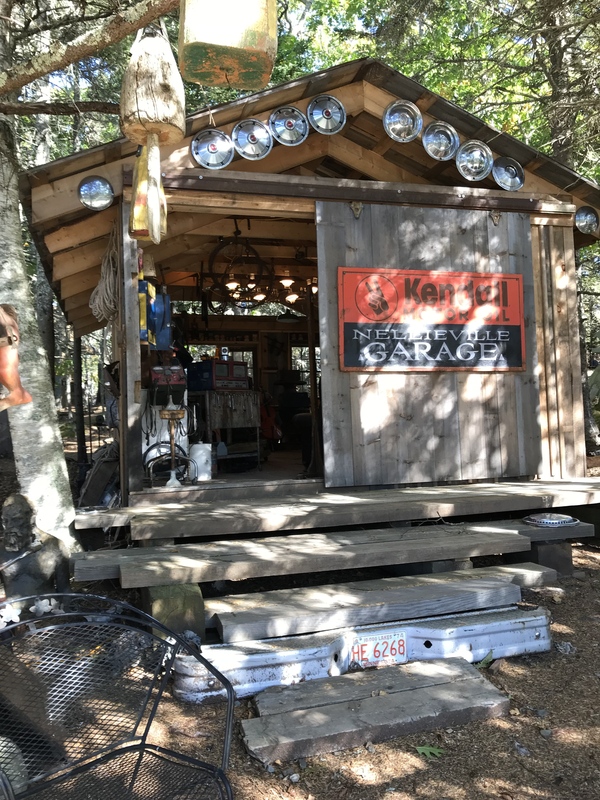 If you’ve ever in Maine — check it out! I DO love Trash Art! What a great term! And I’m constantly amazed at what people can create with castoffs. Thanks for taking a look, but I was pretty sure that you’d love this after being a Burning Man regular. How I’d love to see this. Here’s hoping you get to Nervous Nellie’s someday. Even if you don’t, you can get on their mailing list. The catalog is a hoot! You’re so right, Sue. We just roamed and roamed and almost forgot why we went there in the first place: to buy blueberry jam! And that was fun, too! I need to add this to my bucket list. Sounds like fun. Bob, you’ve got to go there if you get to Maine. We had no idea that a place known for blueberry jam would have “trash art” as creative as what we saw. Thanks for taking a look!